Are you curious about programming? Do you think that coding could be a path that you want to pursue in College? Learning coding and computer science in a positive and supportive environment is invaluable. CodeHS has developed two learning models for high school students. The first model involves teachers facilitating a class to students. Teachers or school districts gain access to the curriculum materials, videos and support that CodeHS offers and set up classes for their students. The second model is to learn as an individual student via the CodeHS website using all the same resources that the teachers or school districts have access to. CodeHS was founded by Jeremy Keeshin and Zach Galant. Jeremy took his first programming class in high school. It was one of his favorite high school classes because it had a completely different feel from the other classes he had taken. The class caught his interest from the start as it was all about problem solving and building something, with the freedom to be creative. When Jeremy was younger he created his own basic website using basic HTML. Jeremy says that programming and computer science have always been fun for him. Jeremy always had other interests, and used programming to supplement them. He built websites for a satirical newspaper that he started in high school (The DHS Flipside and then again in college, for The Stanford Flipside ). When he got to Stanford, he did not plan on being a CS major, but he took his first CS class there and really enjoyed it, so he continued to take more. “It was always challenging, but you were able to write amazing programs.” He says. During Jeremy’s sophomore year of college he got involved with CS198, the intro to Computer Science teaching program, and helped teach a small section class for 2 years. He built the entire code commenting and submission system called “Paperless” which is used by all of the intro classes. In his senior year, he was the head Teaching Assistant of Stanford's largest class, CS106A--and was selected to present three lectures. “I hope that CodeHS can be a site that is accessible to anyone. We are trying to make it easy to get started, really fun, and something where you see what you are learning immediately. We focus on providing help from real people, so when you get stuck, we help you through it,” Jeremy enthusiastically points out. 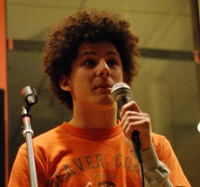 When Zach Galant was 13, he learned to make his own computer games with software called Multimedia Fusion. “There wasn’t any “coding” involved, but it taught me a lot of the concepts,” Zach says. When he was 14, Zach started his own summer camp to teach kids to create their own games using this software. “I’ve taught more than 400 campers over the last 9 years, and I’m now handing it off to my 14 year old brother,” Zach proudly shares. 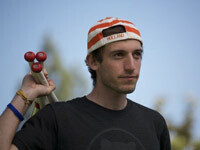 Zach started learning to code his first quarter at Stanford. Because of his experience making games, he learned very quickly and won the programming contest for the intro to Computer Science class. He decided to major in Computer Science with a focus in Artificial Intelligence, and spent 3 years teaching both as a section leader and as the head Teaching Assistant for the intro classes. What makes CodeHS unique to that of other online coding classes? There are many online platforms out there designed to teach coding. 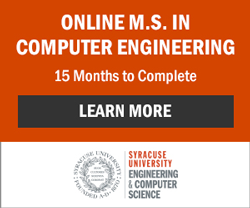 What differentiates CodeHS from the other online learning platforms is that CodeHS provides highly experienced mentors to support students throughout and after the four-week class. These are no ordinary mentors. Students are guided by mentors who have completed or are completing their education at Stanford University in fields like computer science, symbolic systems, math and electrical engineering. Some of the mentors are graduate students at Stanford University and some are currently working as software engineers at companies like Facebook, Pinterest, Palantir and SnapChat. There’s no need to go searching forums around the web for answers to your questions. You can just contact one of the mentors to help you out with a bug or critique one of your creations. 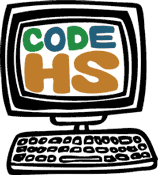 CodeHS is a learning environment specifically designed for high school students. Why learn to code with CodeHS? Jeremy Keeshin and Zach Galant tapped into their teaching experience and educational background to tailor CodeHS courses to the needs of high school students. CodeHS provides students with the appropriate curriculum and interaction they need to successfully complete the course in one to two months. The time to completion will vary depending on the amount of time they are able to dedicate to the program. The coding skills learned with CodeHS can help students determine if computer science or software engineering is a path they’d like to pursue in college or not. Either way, applications, social media, email, e-commerce websites, search engines that use crazy algorithms, video games and all the devices that run them will continue to play a huge role in everyone’s lives. Understanding how programming language communicates with computers and devices to make them do what they do is a useful tool for all students. Check out the CodeHS website to learn more about their classes, mentors and to sign up.